This week, we had the opportunity to learn about hurricane preparedness. Our new home is supposed to be too far inland to be directly affected by hurricanes, but Hurricane Irma didn’t seem to be following the rules. In the end, we had a tropical storm that lasted about 30 hours. Our family and home were unharmed, although some in our area weren’t as lucky. We knew that Irma would be heading our way, but the severity of the storm seemed to change with every updated forecast. We were preparing for a hurricane, and yet we knew that we didn’t need to prepare on the level of those in Florida. Trying to determine what we might need took a lot of energy, more so perhaps because we had never done this before. With so much mental energy going toward Irma, I didn’t have much to spare beyond some creative meals to use up food in the freezer. In any down time, I busied myself with nervous knitting. I added block after block to my sock yarn scrap blanket, almost doubling the length of the blanket. It’s starting to look like the beginning of a blanket now, instead of an oddly long scarf. Since the garter stitch construction of each block is the same, I was able to keep my hands busy while my mind stayed on the storm. I could easily stop and start at any point to add something to a list or check a weather alert. 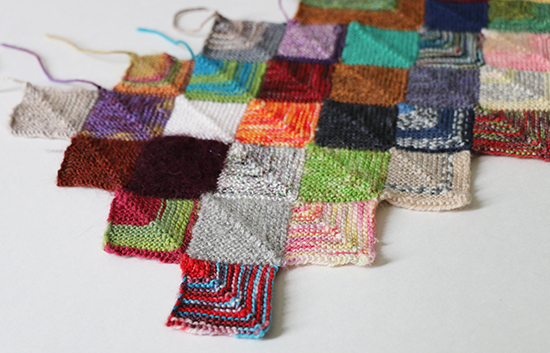 Choosing the colors for each block was a welcome break for my whirling brain. I typically weave in the ends after every few blocks, but this time I skipped that step. I see a long end-weaving session in my future! Hi! Found you from the Front Porch! Following you on twitter and Instagram. I love this project for using scraps. I am making one of these blankets as well and I think yours is beautiful. I am so glad you and your family are safe. Thank you, Kim. I'm really enjoying having these blankets as a long-term project.